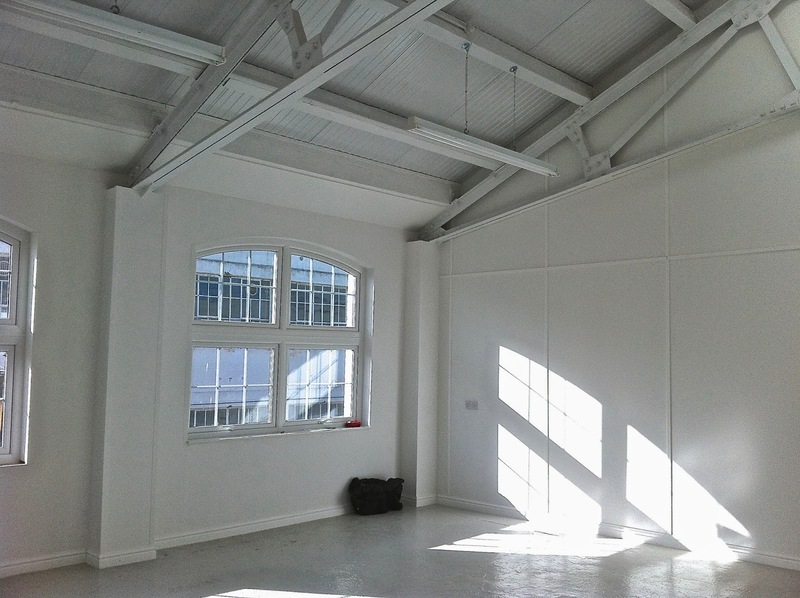 At the end of last year, our landlord at the studio kindly offered to put our rent up by 60%. Strangely, us poor struggling artists just couldn’t afford it. Quite honestly, though, I did feel I’d outgrown my space a bit.. So we went and looked at this one, which needed a few finishing touches, obviously. Ditto the outside – but that’s okay. We had a dream. And, anyway this is Woolwich, so just look at what was on the other side of the building. 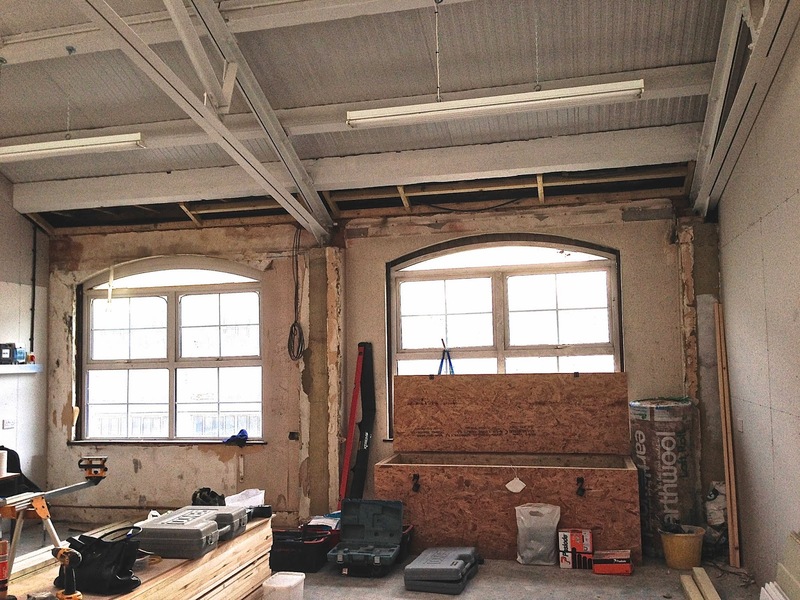 A few months later, our leap of faith had turned into this…. And so, The Great Moving Out Day dawned bright and early. Many dust-filled, back-breaking hours later, it was finally time to get the broom out..
Where’s all this stuff come from? And more importantly, where’s it all supposed to go? 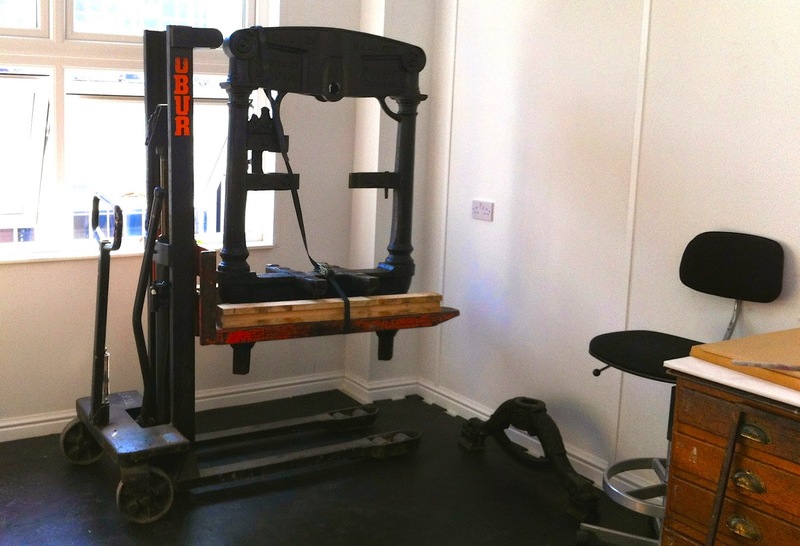 ….because if the cast iron cracks on the 170 year old Albion, then it’s done for. A lovely day for Louise, sorting out the storage shelves. 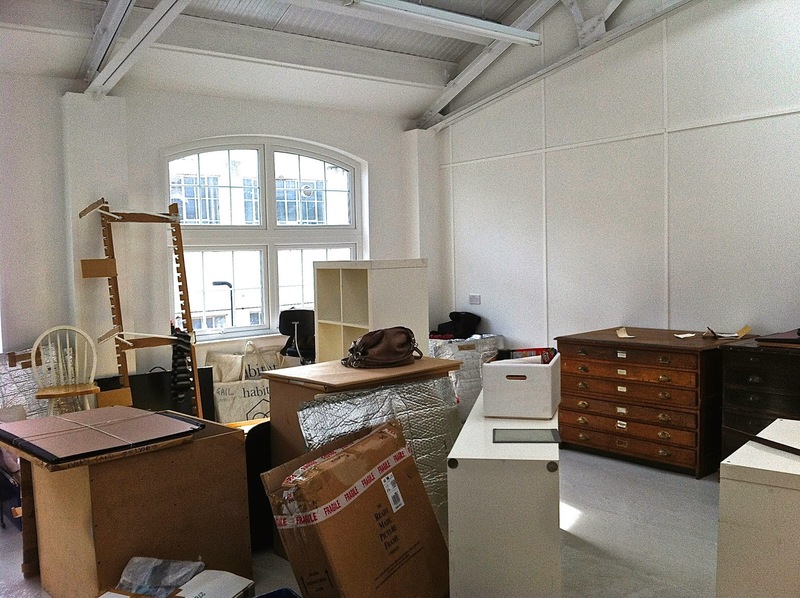 I think that’s probably enough stuff on the shelves for now…..
At last, Home Sweet Home! 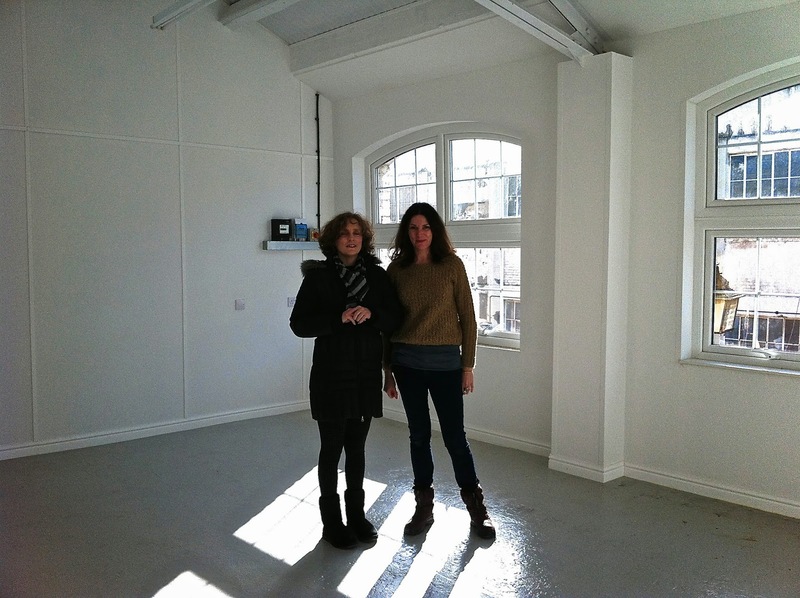 So, another year, and another Affordable Art Fair is over. 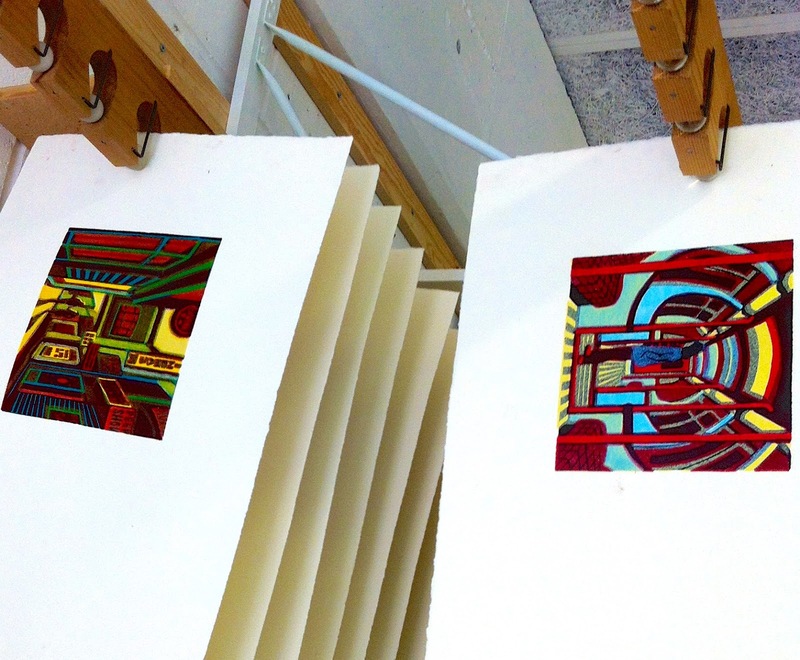 It’s an unusual experience for me, in that I get to meet a lot of people who are interested in printmaking, but who are also interested in buying my work. 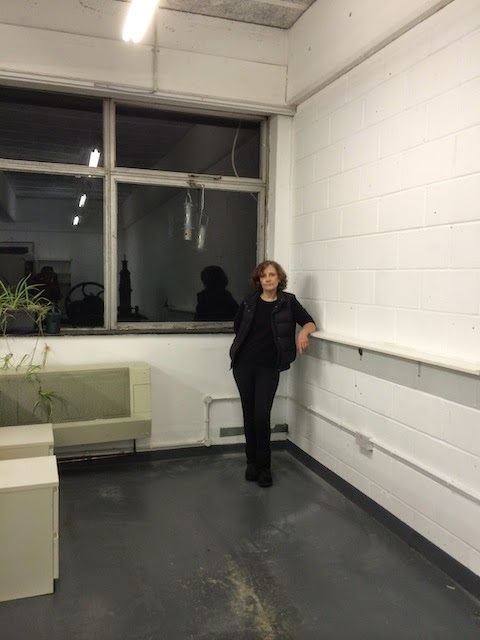 There were a lot of questions, as always, and sometimes it’s hard for us artists to articulate our answers in a clear and informative way (in other words, we can be unsociable, inarticulate and slightly feeble). The most important thing here is to appear confident – if you look at the ground and scuffle your feet while you’re talking about your work, then all those lovely potential customers won’t feel too confident either. They’re hopefully going to spend their hard-earned money on your work and they need to feel that they’re making the right decision in choosing one of your pieces. I know how hard it is though – I’ve never come across an artist who actually likes talking about their work (“I’m not a Performing Seal” and “My work speaks for itself”, etc.,) but like everything in life, the more you do it, the easier it gets. Talking to art fair visitors is also great for making you feel like a bit of an expert – you tend to forget how much experience you have. When you’re in the company of people who aren’t artists and therefore may not know too much about your work, and the processes you use, it can make you feel very knowledgeable and that’s rather nice. All that noisy confusion of the fair certainly brings you down to earth – no bad thing for artists who can get very precious about their work if given half a chance. A few days of art fair visitors walking past your work as if it was completely invisible (or even worse, saying loudly to no-one in particular, “Well, I don’t like that”), certainly toughens you up. If nothing else, you learn to shrug internally and ignore it, at least until you can get home and start weeping into that pint glass of beer, wine, or whisky (depending on how bad it’s been). Above all, it’s a pleasure to be surrounded by people who appreciate the value of original art and who see a sense of value in what artists are trying to do. Leaving it to the Last Minute…. Rectory Gallery in Spitalfields. The van is coming at nine tomorrow – oh yes, there’s nothing like leaving it until the last minute….. 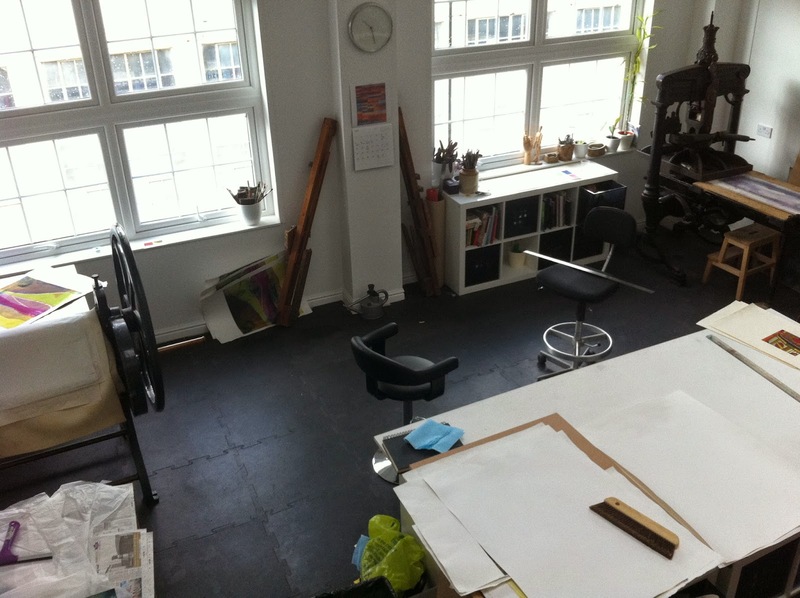 I spent the last couple of days before the Easter break cleaning and tidying the studio. Well, it’s a dirty job but someone’s got to do it. After carefully looking around to make sure that nobody else was waiting patiently with mop and bucket at the ready, I had to assume that the person doing the cleaning was going to be me. And doesn’t it all pile up? 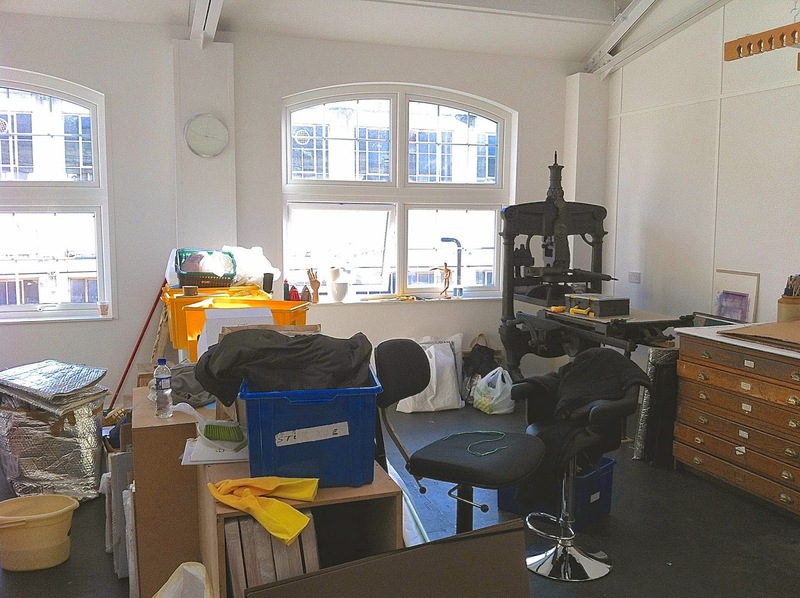 I have a perfectly good sized space to work in but somehow, while my back was turned, several hundred frames and several thousand sheets of paper and card muscled their way in. Well, I might be exaggerating a bit here (but not by much). 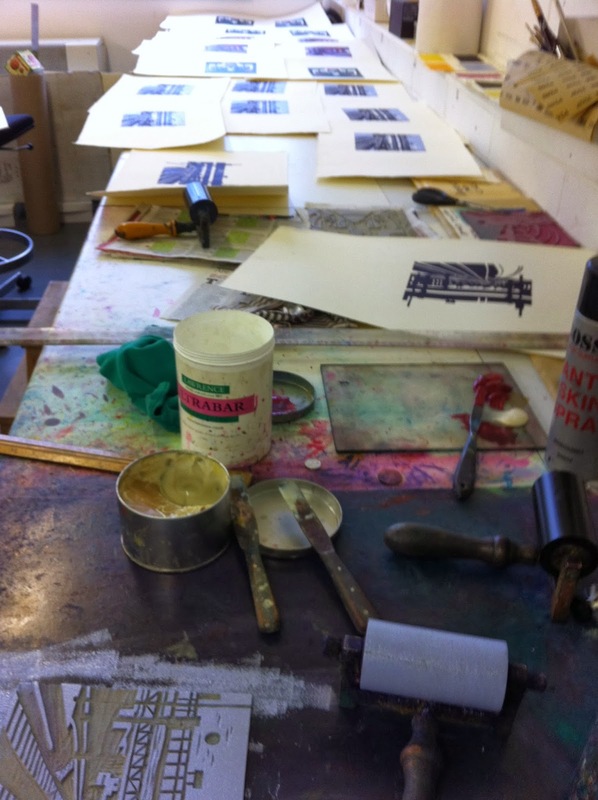 And then there’s all the rubbish – discarded proofs, empty ink tubes, dirty rags, lino clippings – oh dear, I really can’t go on. Still, as I kept telling myself brightly, whilst covered from top to toe in dust and grime, it was definitely going to look fabulous when it was finished. Funnily enough though, it all looks much the same as when I started. Why is that? I’ve had an idea (yes, I know, make the most of it). 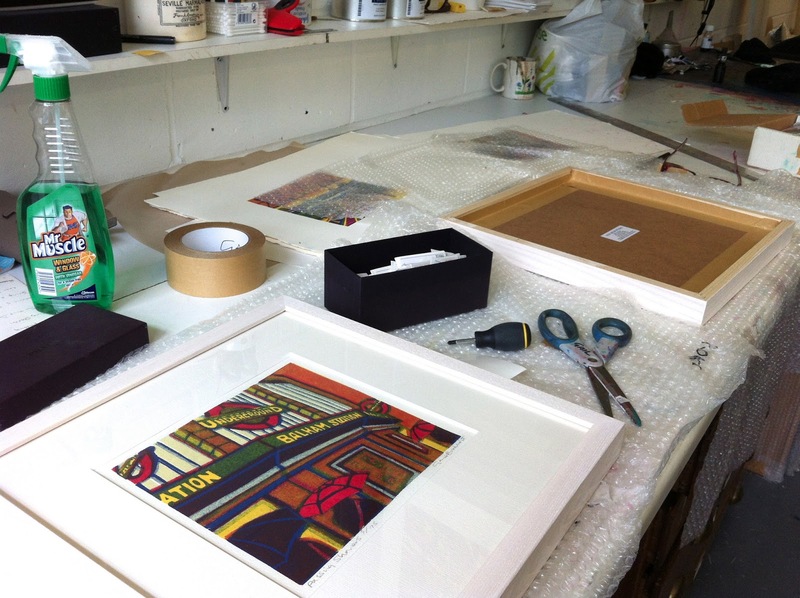 I thought I might post a photo on my blog every day this month – of the studio, work in progress, the odd private view, etc. And as February is the shortest month, that would mean I’d only need to do 28 posts. Actually, that’s quite a lot, put like that. Perhaps it should be more a case of posting every day until I get bored. 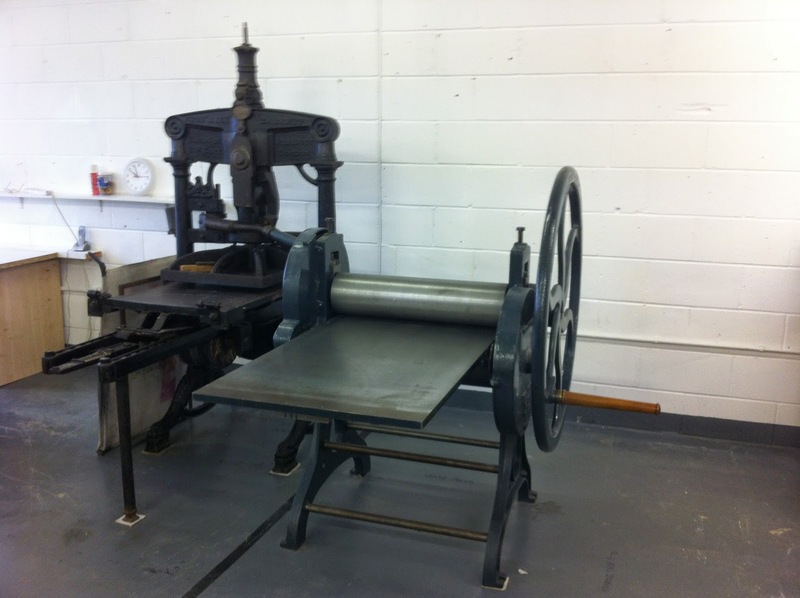 So just the six posts then…. 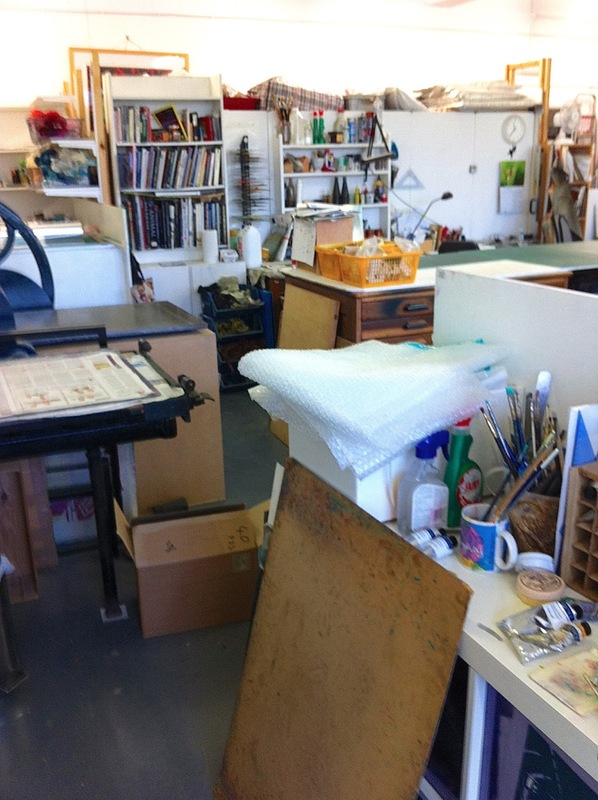 And the studio is looking a bit of a mess – I’m sure it won’t look so bad if I go down the other end. Nope, not much improvement – perhaps a little light housework is in order….. 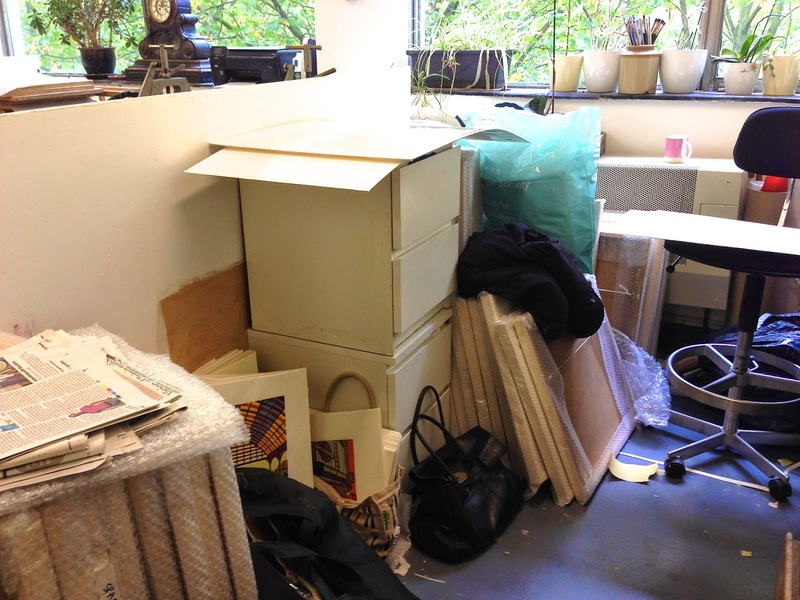 This is my admin corner – but somehow it’s been overrun by creeping printmaking essentials/rubbish. To say nothing of the creeping drink cans – but at least they’re organic, I think virtuously…. Perhaps I’ll make a start in the inks department – it is looking a little disorderly, after all…..
That’s better – I’m wondering if the hoarding of empty ink tubes is just a little pointless? 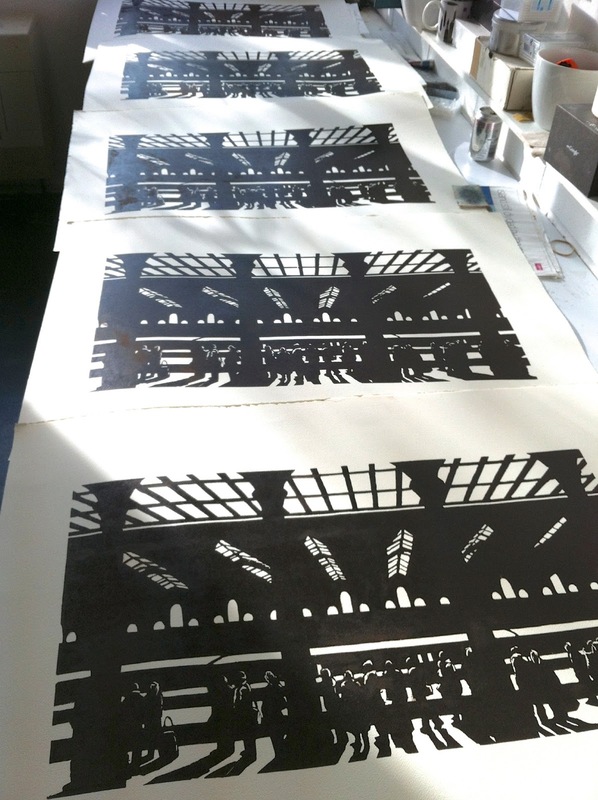 One hundred postal tubes in the studio and ready to use …. 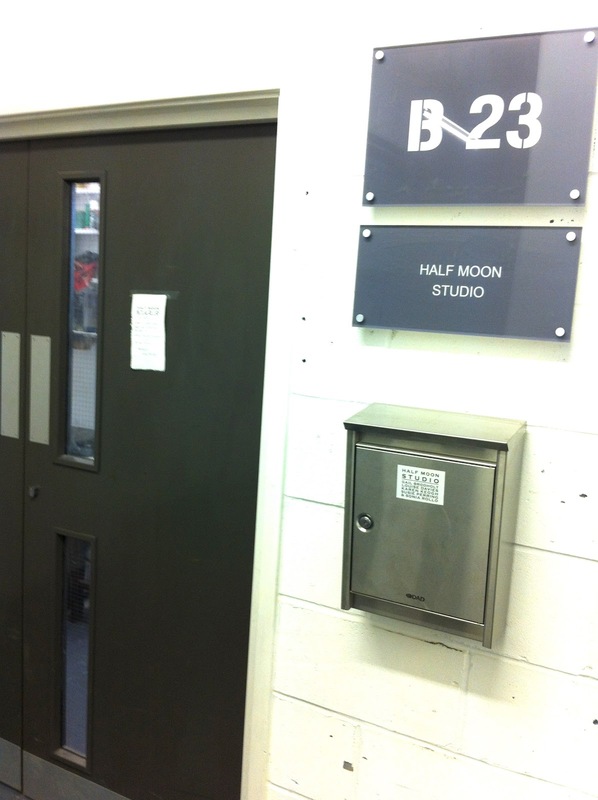 A Little Tour of the Studio…. 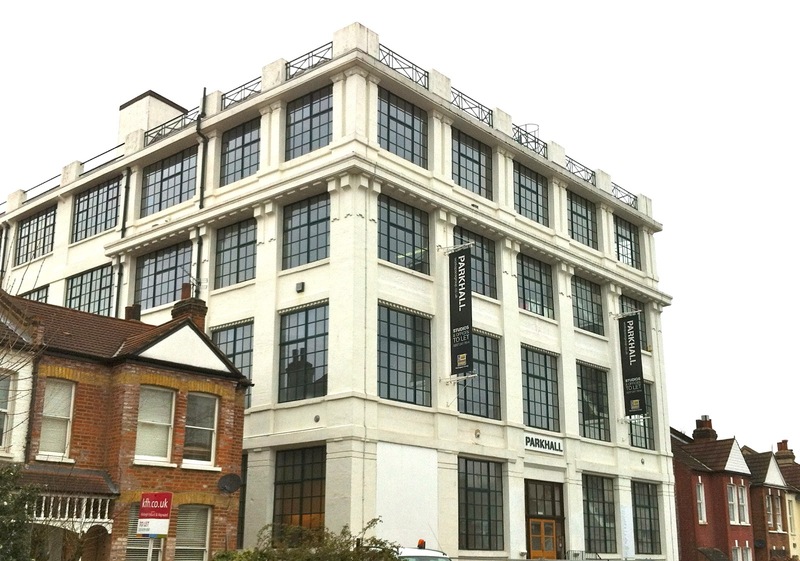 Here is the main building – an impressive Art Deco ex-Marconi factory rising up out of the wilderness of Victorian terraces that is South East London. Can you imagine getting planning permission for something like this now? 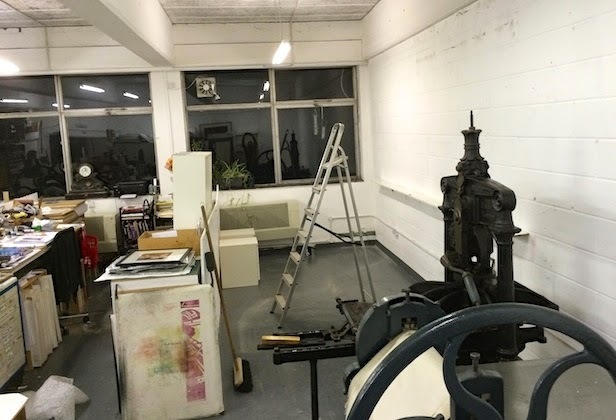 And here is where our studio is situated – the not-quite-so-impressive back extension, which I would guess was probably built in the 1960’s. 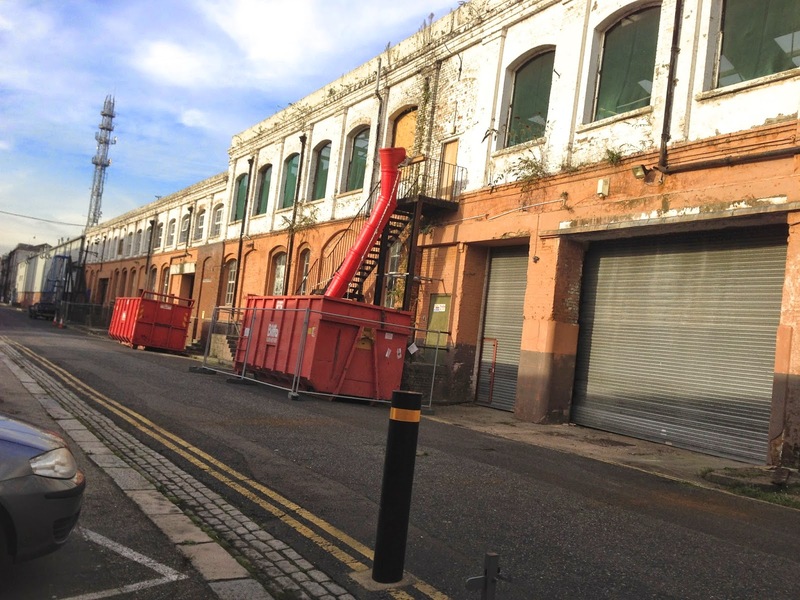 Oh well, at least there’s parking and the skips are handy…. 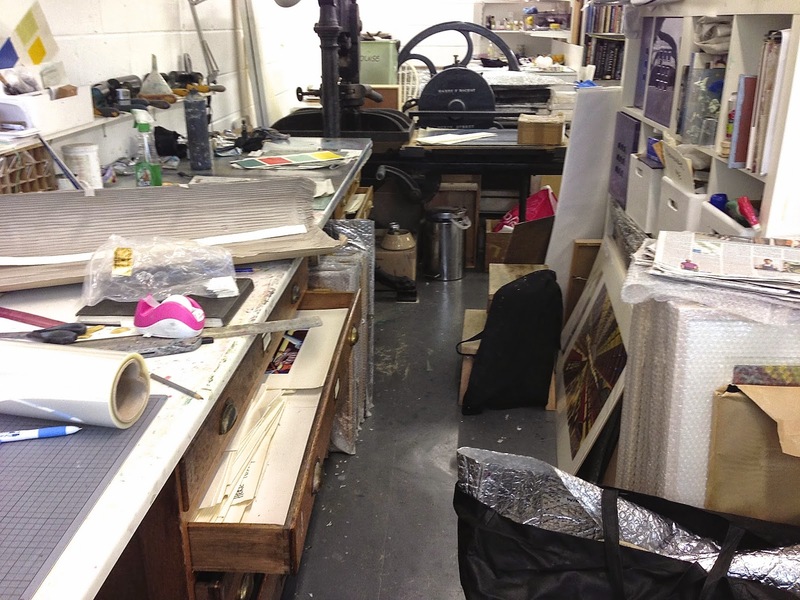 My section of the studio – possibly in need of a bit of a tidy…. 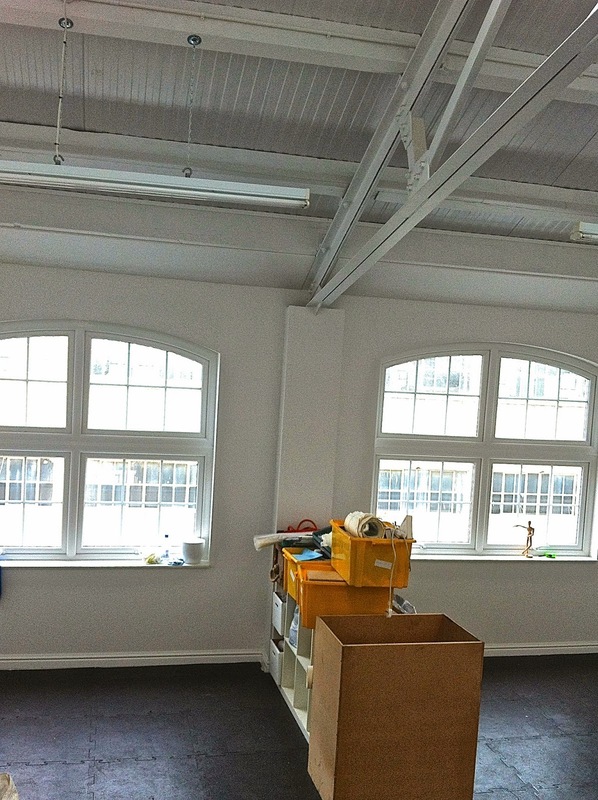 Looking across the width of the space towards the back wall of windows- as you can see, there is a distinct lack of housekeeping in all parts of the studio. We studiously ignore that side of things…..
We feel strongly here that we need plants in the studio to help with the air quality – poor babies…..
And finally here is our view over West Norwood Cemetery – 40 acres of it and still used today – a nice daily reminder of the general shortness of life and how it’s best to get on with it before it’s too late….